Academics at Teesside University are helping a Tees Valley business maximise the potential of its recycling plant. Adrian Parnaby (left) and Peter Scott are pictured with the newly commissioned £1m wash plant. 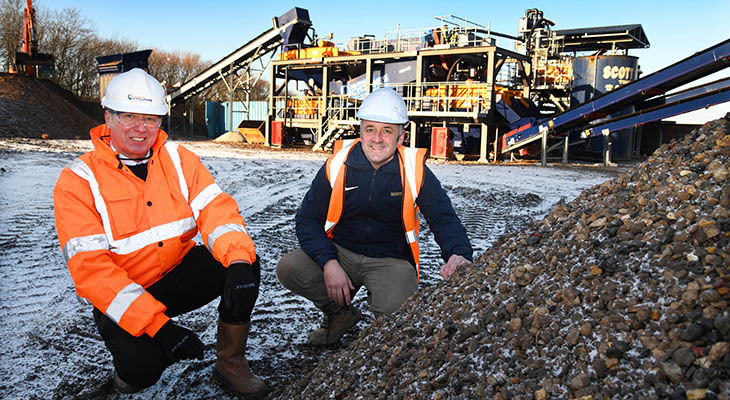 Recycling experts Scott Bros. has invested £1m in a new and environmentally-sustainable 'urban quarry'. Peter Scott, Transport Manager at Scott Bros, said: 'We have created what is in reality an urban quarry which is producing in-demand products for the construction industry by recycling waste soil excavations. 'Scott Bros. has made a significant investment because we believe this sustainable alternative will form a major part of our future business. We have already received a great deal of interest since the wash plant was commissioned. Dr Paul Sargent, Lecturer in Civil Engineering at Teesside University, said: 'A key strand of research at Teesside University is dedicated to addressing the challenge of the depletion or degradation of natural resources. The partnership between Scott Bros. and Teesside University received financial support from the Knowledge Transfer Partnerships (KTP) programme. KTP aims to help businesses to improve their competitiveness and productivity through the better use of knowledge, technology and skills that reside within the UK knowledge base. This successful Knowledge Transfer Partnership project, funded by UK Research and Innovation through Innovate UK, is part of the government’s Industrial Strategy. Scott Bros is working with academics at Teesside University's School of Science, Engineering and Design, to find a practical use for the residue. Recycling experts Scott Bros is working with academics at Teesside University’s School of Science, Engineering and Design, to find a practical use for the residue.